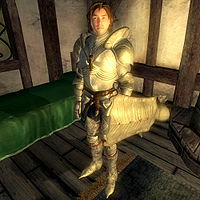 Jhared Strongblade is a Breton knight and one of the few surviving Knights of the Thorn, mainly because he did not accompany Farwil Indarys and the others on their ill-planned assault on the Oblivion Gate outside Cheydinhal. Jhared wears a near complete set of steel armor: boots, greaves, cuirass, and gauntlets. He also wears his Knights of the Thorn medallion. In combat he relies on a steel longsword and a steel shield. He carries a small amount of gold. He also has access to the Knight's leveled spell list. Jhared Strongblade begins his day at 8am; after he wakes up he will explore the Knights of the Thorn Headquarters. After wandering around his order's residence for a few hours he will break for a meal at noon. After a two hour long meal he will go back to exploring his home until midnight, at which time he will go to sleep in his bunk at the headquarters. He will then wake up at 8am to begin his daily pattern anew. Speaking to Jhared before the events of his related quest start will have him kindly greet you by saying: "I bid you welcome." If you enter the Knights of the Thorn Headquarters without first being admitted into the order, and after the Oblivion Gate outside of Cheydinhal has opened, speaking to Jhared will have him request that you leave: "What are you doing in here. This is the headquarters for the Knights of the Thorn. No one else is allowed inside. If you stay here, and Lord Farwil finds out when he gets back from his latest quest, he will have me thrown out of here. Please, leave at once." After saying this he will end the conversation, not wanting to risk his status in his Knightly Order. If you join the order by saving Farwil Indarys from Oblivion he will be much more polite by greeting you with "As the newest member of the Knights of the Thorn, I bid you welcome!" Asking him about the Knights of the Thorn after his order's Pyrrhic victory in the Deadlands will have him claim they are still a mighty force to be reckoned with, despite recent events. "There may be only three of us left, but we still can match blades with the best of them." If you ask him about the Oblivion Gate that killed many of his comrades he will say "I'm just glad we escaped with our lives. Oh, don't tell Farwil I said that..."
Asking him about the Knights of the Thorn before Farwil's return would have had him boast about the order's abilities: "We are led by Farwil Indarys. Yes, the Count's son himself. Our job is to protect Cheydinhal from any aggressor. We are sworn to this duty and would die before letting any harm befall her. There are seven of us here, including myself. If you're here to join up, I'm afraid you'll have to speak with Farwil." However this dialogue probably deliberately never appears: the topic (which would have been a duplicate) is never added, and Jhared is supposed to dismiss you before Farwil's return as you must be trespassing in the Knights of the Thorn Headquarters to speak to him; once you have been awarded membership, the dialogue is no longer relevant. Sometimes he will welcome you as a new member even when you are not a Knight of the Thorn. This page was last modified on 1 July 2013, at 05:17.